SINGAPORE, Nov. 15 (Xinhua) -- China and Singapore vowed to work together to promote bilateral ties and help boost relations between China and the Association of Southeast Asian Nations (ASEAN) on Wednesday. 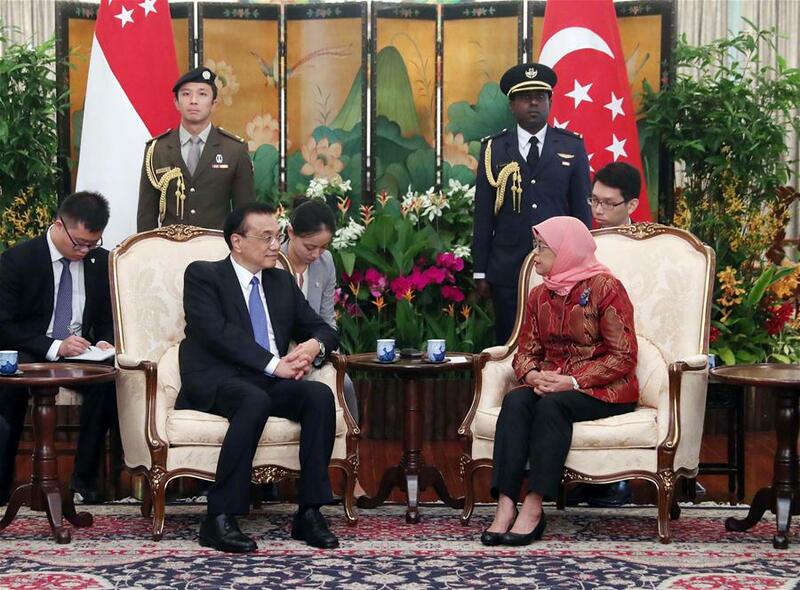 Chinese Premier Li Keqiang, who is on an official visit to Singapore, met with Singaporean President Halimah Yacob Wednesday. During their meeting, Li first extended President Xi Jinping's cordial greetings to her. Upholding the tradition of friendship, China and Singapore have had frequent high-level visits and close personnel exchanges, with pragmatic cooperation expanding to new areas and benefiting people of the two countries, Li said. China is willing to work with Singapore to achieve greater progress of bilateral relations in the new era, he said. This year marks the 15th anniversary of the establishment of the China-ASEAN Strategic Partnership. Li said China always views ASEAN as a priority in foreign relations, and appreciates Singapore's active role in promoting China-ASEAN relations as the China-ASEAN country coordinator and the ASEAN's rotating chair. China is willing to work with Singapore to promote further development of China-ASEAN relations and make new contributions to the peace and development of the region and the world, Li said. For her part, President Halimah Yacob said the reform and opening-up that China launched 40 years ago has not only put China on a fast track of growth, brought about benefits to China and the world, but also started a new journey for Singapore-China ties. The more than ten cooperation deals signed during Premier Li's visit will not only provide a new platform for deepening bilateral cooperation, but also lift Singapore-China relations to a new level, she said. The Singaporean president also expressed hopes that the two countries expand cooperation areas and deepen people-to-people exchanges in the fields of culture and tourism, so as to consolidate the foundation for bilateral relations. Singapore is ready to work with China to promote greater development of ASEAN-China relations, the president said.